Disclosure: I received a Bath Set item to review. No other compensation was provided. All opinions are 100% my own. Looking for the perfect Baby Gift? 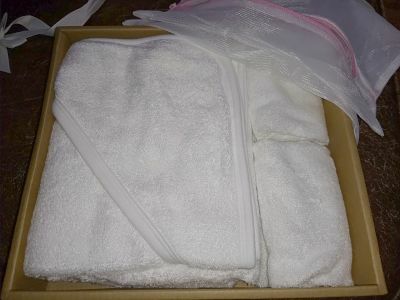 An organic towel-set that works well for boys or girls can be the perfect gift to take to your next baby shower. Smit Co LLC is also offering a 20% savings, too! The Bamboo Hooded toddler Bath Set is white and organic. The set comes packaged beautifully for a gift, or just purchase it for yourself. The size works for a baby or a toddler. Sizes can be seen here. 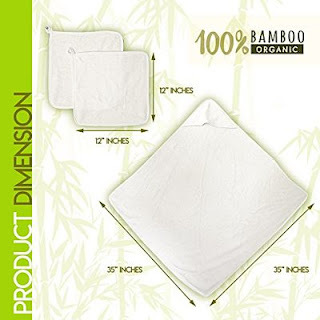 This premium set is double-stitched organic bamboo and comes with it's own mesh bag for washing. This helps your bath towel set to last and last! It's hypoallergenic and antibacterial while it's natural and organic. The silky fabric will be so gentle on your little one's soft and sensitive skin. This set helps you as you protect your baby from unwanted allergens and irritants. All new moms will love this set! I'm so happy to offer you a great deal on all Smit Co LLC products. You can save 20% off your entire cart by using this code when you shop here at AMAZON. I hope you'll take advantage of this great deal and check out all the wonderful items from Smit Co LLC. They offer a huge selection of gifts for girls. You'll find journals, scrapbook sets, jewelry, and more.